Is Regular Grass Healthy to Eat? Although regular grass provides nutrition and fiber to livestock and other animals, the high cellulose content is difficult for digestion by humans and, as a result, provides very few nutrients. A healthy food choice consists of a food item that contains a high level of nutrients, vitamins and minerals in comparison to calories per serving. Regular grass is not helpful in meeting daily human nutritional requirements. 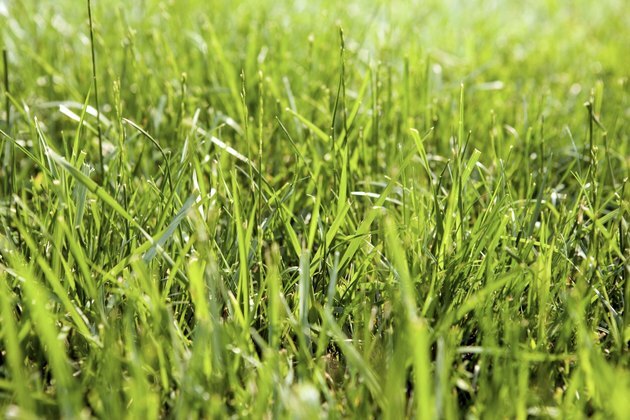 Aside from the fact that it’s difficult to digest, pesticides used to control weeds and insects are also a concern in considering the consumption of grass. Exposure to pesticides used in lawn care may result in a number of health risks, including cancer and birth defects. To minimize pesticide risk, it’s important to thoroughly wash your hands after contact with treated grass. Wheat grass is a possible alternative to regular grass consumption. Wheatgrass may be helpful in relieving coughs, bronchitis, gout and constipation, however there is no scientific evidence to support this. The American Cancer Society notes that wheatgrass has been touted as a cancer treatment, though no research supports this hypothesis. Pica is a condition where people crave the consumption of non-food items, such as grass. Commonly craved items are ice, clay, paint or sand. This condition may be caused by malnutrition, iron deficiency anemia or lead poisoning and the group it’s most often seen in is young children. If you are craving non-food items, it may help to consult your doctor. A healthy diet consists of fresh produce, lean meats, low-fat dairy and whole grains. For help in planning a healthy menu, consider speaking with a Registered Dietitian. Dietitians are health professionals, specially trained to plan nutritious eating plans tailored to specific health needs. They can work with you to design a healthy food plan that incorporates your food likes and dislikes, to help you achieve and maintain optimum health.